As I write this spring presidents report it is becoming evident that that season is in full swing. The narcissus are in flower, the magnolias are showing off and the smell of freesias and native pittosporum (both invasive weeds) fills the air. Those heady scents are evocative. They remind me of spring at my parent’s house or running around the tan in warming weather, when I was a lot younger, thinner and had legs that worked properly. In the Gardens at Olinda the large leaved Rhodos have been flowering very well this year. 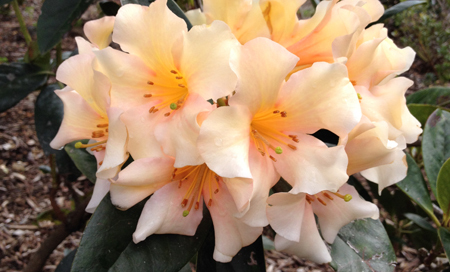 The early Rhodos are already producing an excellent display. The giant Sir Robert Peels are noticeable above the roof tops both in the Dandenongs and in Melbourne. Spring may make you think of spring shows at Olinda, but again we will not be having a Spring Show, instead we are encouraging members to provide entries of Rhodos for the Ferny Creek Show. Prue Crome, Andrew Rouse and Michael Hare have done a fantastic job of organising the 2014 National Convention for the last weekend of October. There are a great range of activities for you to attend. You can go to the public talk given by George Argent and Frederic Danet at the Mueller Hall on the 23rd, the conference on Saturday with a very interesting range of speakers and the opening of the Vireya House, the conference dinner at the Eastern Golf Club and on the Sunday a tour of three excellent Mt Macedon gardens. You can choose which of these events most interests you or you can, of course, come to the whole lot.